I also examined the Webroot Mobile for Android web page, and there wasn't any mention or link to any McAfee anything. Also, the WSA Complete for Windows running on my PC didn't do anything during the McAfee install and security scan. Does anyone have any idea why and how this happened? For years McAfee Security Scan has been bundled with Adobe Flash and Reader and other products so you have to be careful when installing programs. https://get.adobe.com/flashplayer/ so I would call it a PUA/PUP or just plain Adware. For years McAfee Security Scan has been bundled with Adobe Flash and Reader and other products so you have to be careful when installing programs. Thanks @TripleHelix that's what happened. 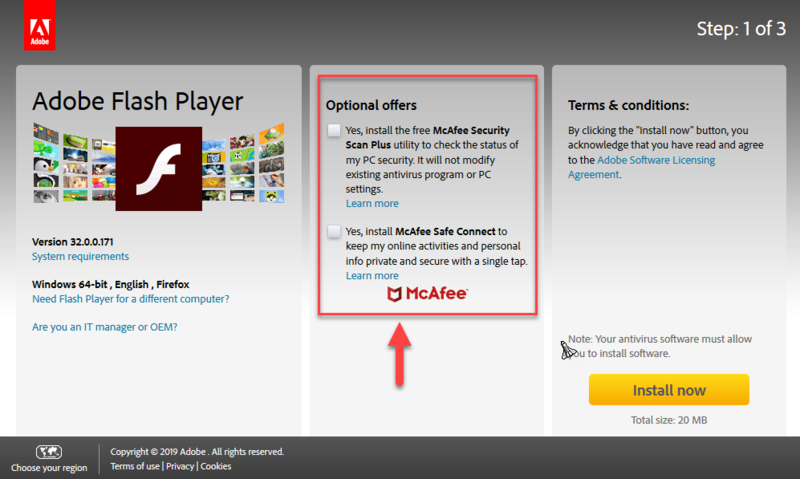 Up until now, I was always careful to not allow any of that McAfee stuff that's included as the default in Flash updates. I keep Flash updated in case I need it but I have it disabled in my default browser, Firefox. But today I was distracted and not paying attention and they finally caught me off guard. The fact that McAfee ran when I was at the Webroot Mobile Play Store site was just a coincidence. With all of the Webroot issues to deal with recently, I'm spooked about everything related to Webroot. My bad, I'm an idiot. @happy no worries as it could happen to anyone!